First, read this blog entry by Newfoundland's Bruce Mactavish. Done? Ok, cool. Note the part about the number of Townsend's Warblers recorded near St. John's, Newfoundland...a whopping sixteen for this western vagrant. 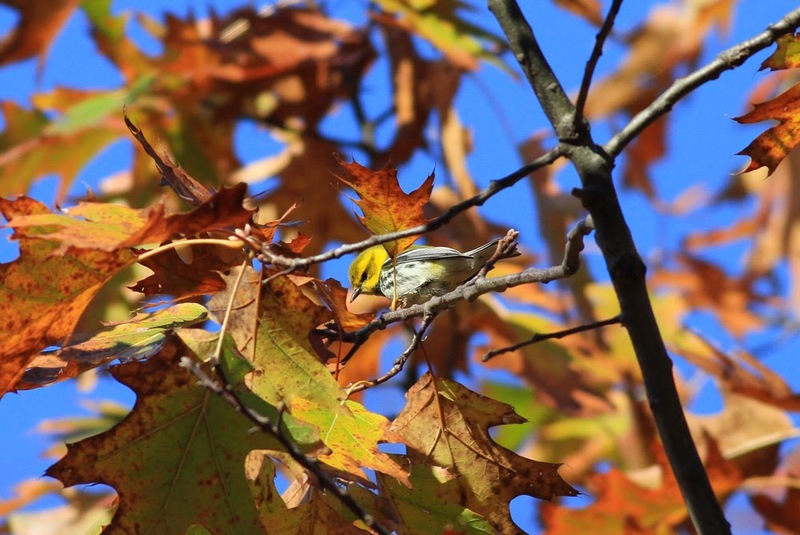 Connecticut, however, has zero records of Townsend's Warbler. It is arguably the most overdue bird to be found in CT...certainly a no-brainer for the top three! A few days ago I was birding the woods at Lighthouse Point in New Haven, CT. I was pishing and playing a screech owl tape, and birds were coming in. I heard a warbler chip note, at first distantly...then a bit closer. I smiled and thought, "I know that chip note...that belongs to one of three species I'm familiar with: Townsend's (mega rare), Hermit (mega rare) or Black-throated Green (common fall migrant, but very uncommon in November)." These three closely related species have rather similar call notes. With the calendar reading November and western vagrants on the mind, I was desperate for a glimpse of this bird as it came closer. Eventually, it showed, as pictured below. Oh man! Tough one on the Black-throated Green ( a few palpitations maybe).